Four and a half years ago Anna Calvi last played in Manchester, at the Albert Hall, and it all but sold out the 2,200 tickets. The Ritz sold 700 tickets for this one. How do you explain that? Is it because she left it too long (five years) between albums? So people forgot her when there are more new bands surfacing each day than bits of plastic flowing into the oceans? Or, because at £23.50 the ticket price was considered to be too high? Perhaps she overdid the ‘queer’ thing with new album Hunter? I heard some of her original fans weren’t too keen on that. Or all of these; or none? But enough of the economics already. What those folk who might have gone, but didn’t, actually missed was one of the most riveting shows I’ve ever seen. You literally could not take your eyes off her. This is a vastly different Anna Calvi to her earlier performances. She’s always been able to shake off her innate fragility and soft-spoken diffidence once she strapped on the Telecaster. But the Calvi who appeared suddenly on stage out of the dark to open with the instrumental ‘Rider to the Sea’ from her debut album was like a woman possessed, stalking around the stage from the word go like a lion mapping out its territory. At the end of the show she raised her arms and signalled the audience to applaud her, to come, join me, on my mission, like Jesus to the Apostles. She has become the A-A-Alpha female she sings about in her own song. After a short break to deliver the haunting ballad ‘Away’ the demon was back, racing into her first guitar solo of the night (there were many) on ‘Indies or Paradise’. At one point she picked herself up off the stage, hair covering her face completely so she couldn’t see and reminiscent of Samara Morgan climbing out of her well in The Ring. Considering that this woman did not even start singing until her mid-twenties because she considered her voice too weak, what happened on ‘Don’t Beat the Girl out of my Boy’, her impassioned plea for cross-gender tolerance, verged on the unreal. The album version is quite astonishing but the prolonged scream she dragged up from somewhere deep in her slight frame in this live setting – and delivered on her knees, lying backwards as if in a yoga position – was off the Richter scale. As the show progressed I couldn’t help but draw comparisons with St Vincent, another female modern guitar player of the highest order. It’s almost as if they have swopped personas. As I reported in a St Vincent review a few weeks ago, Annie Clark has reined in the athletic part of her act and now largely stays put to deliver her music. Anna Calvi, who used to do just that, has gone in the other direction, throwing herself around the stage and onto the floor, with or without her guitar, and tossing away her bottle of water with utter disdain as if it were Harvey Weinstein or Brett Kavanaugh. At one point she ended up on her back facing away from the audience with her legs in the air and I couldn’t help but see Clark’s infamous human inverted Cross being parodied. And she’s physically fitter than Annie, too. Then, as if she’s assumed Clark’s mantle of ‘Future Cult Leader’ she lasers with her eyes and whispers Lorelei-like to individual members of the audience. I can’t think of a better example of this hyperactivity than ‘Wish’, from Hunter, which on the album is almost an operatic piece, complete with dulcimers, violins, and operatic voices. On the night she turned it into an out-and-out rocker with numerous false endings but always returning to that almost heartbreaking refrain, “Cherie…your eyes”. Whoever Cherie is, she must mean a lot to her. “I’ve got one more wish before I die” she sang, “don’t stop me, don’t stop me, don’t stop me”. I doubt even Mike Tyson could have stopped her. Before that she offered the lush ‘Swimming Pool’, not my favourite track from Hunter but which gave her the opportunity again to demonstrate those remarkable pipes. 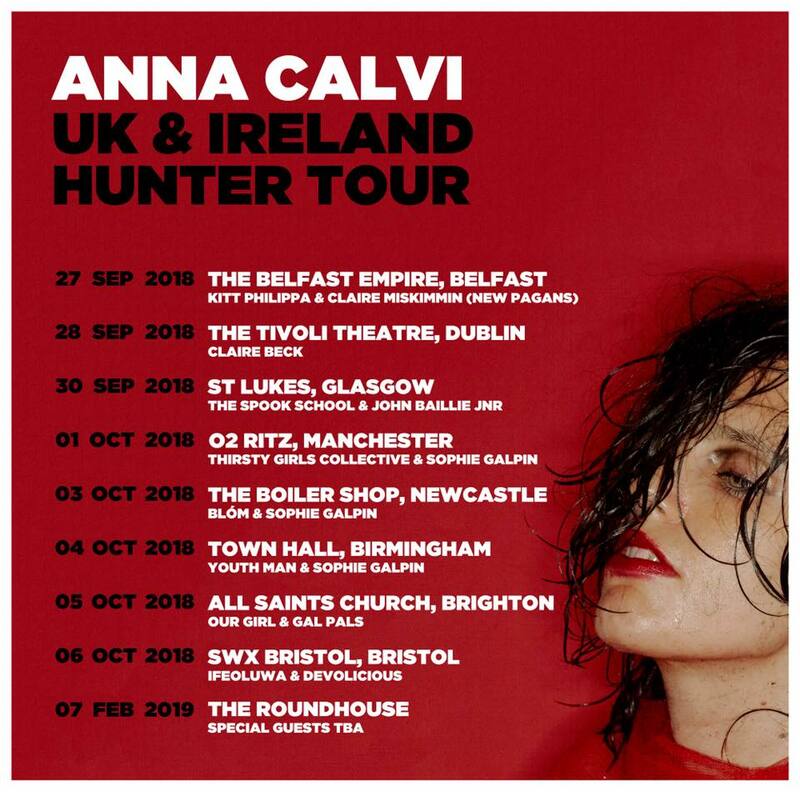 The choice of material for the show (and all the others, she isn’t varying it other than marginally in the running order) speaks volumes about where Anna Calvi stands today. The set contained four tracks off the first album, and half of them (I’ll Be Your Man, Suzanne and I’) seemed to have been chosen to reinforce the queer message on Hunter. Gone are the old standards that turned up in every show, such as ‘The Devil’, ‘Jezebel’ and ‘Love Won’t Be Leaving’. I thought I’d miss them but while I’m straight as a die I didn’t mind all the queer stuff because it is clear that Anna Calvi lives these songs rather than just performs them. The selection also poses a question. Why was there not a single song off second album ‘One Breath’? And again, this is the norm. From what I can see she has only performed one song (‘Sing to Me’) off that album since the pre-tour shows began in June. It is almost as if she is trying to expunge that period of her life. The 14-song set was over all too quickly. Along with the rest of the crowd, for me it could have gone on all night. And it finished in as dramatic a fashion as you can imagine. Not with ‘Love Won’t Be Leaving’ or ‘Jezebel’ but with a cover of Suicide’s ‘Ghost Rider’ which ended in the mother of all guitar solos, with her steel slide rolling along the stage and off into the wings as if her finger had come off, while she dropped again to the floor in an unimaginable position, then sitting up playing the battered Telecaster between her legs like it was a lawnmower before jumping up to drag it offstage, while it played itself. I hinted in my review of Hunter that I believe Calvi has developed into the most complete, all-round entertainer the music business has to offer in this country, male or female, both in the quality of her creations and her ability to execute them, live. And I saw nothing here to dissuade me from that opinion. Kudos too, to her ‘orchestra’, Mally Harpaz and percussionist Alex Thomas, who somehow manage to keep up with her. If you get a chance to see her and them, take it. She doesn’t come around very often and right now she is at the absolute top of her game. Sh-t! Wow isn’t she coming to Stockholm? Why is the planned gig this month cancelled! After reading the live review I realise that we’re really missing someone/something over here….